This program was recorded on Wednesday, September 21, 2016, during Oracle OpenWorld in San Francisco. "During" is the operative word, since the podcast was actually recorded in my hotel room, several blocks from Moscone Center, where OOW16 was held. The topic was suggested by Oracle ACE and frequent OTN contributor Arturo Viveros, who, along with other panelists, was in town for the big Oracle event. Listen. Mentioned several times during the podcast, this 8-part article series, written by Oracle ACE Directors Lucas Jellema, Torsten Winterberg, Mark Simpson, and Lonneke Dikmans, takes a deep dive into a solution built during a live demo that encompasses 10 different Oracle PaaS service. Technical discussions, articles, videos, and other content covering Oracle’s PaaS and SaaS offerings. Videos featuring experts offering technical tips and best practices. The topic of API Management is getting hotter by the minute. In this four-part OTN ArchBeat Podcast four experts discuss what’s behind the increased interest, and offer some suggestions on how you can make API Management… well, manageable. Listen to the podcast here. Yes, you can be a guest producer for an OTN ArchBeat podcast! It’s easy! You pick the topic and the panelists. I do the rest. Click here for more information. Microservices. Big deal? No deal? For more than a year the conversation about microservices has been percolating — and on occasion boiling over. 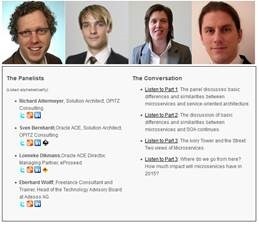 This new series of OTN ArchBeat Podcast programs jumps into that conversation with a panel of community members who have skin in game, and well-reasoned opinions on the potential impact microservices will have on enterprise IT.